Selenium is found most abundantly in Brazil Nuts, organ meats, seafood, and wheat germ. 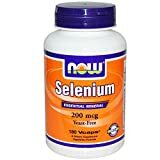 NOW Foods Selenium 200 mcg VCapsSelenium is an essential trace mineral and functions as part of the antioxidant enzyme glutathione perioxidase. It is bonded to the essential sulfur amino acid, methionine, in a naturally occuring form as found in the diet. Selenium is found most abundantly in Brazil Nuts, organ meats, seafood, and wheat germ. This entry was posted in Buy Supplements and tagged Foods, Selenium, Vcaps by TOSMS. Bookmark the permalink.